This Hubble Space Telescope view shows one of the most dynamic and intricately detailed star-forming regions in space, located 210,000 light-years away in the Small Magellanic Cloud (SMC), a satellite galaxy of our Milky Way. 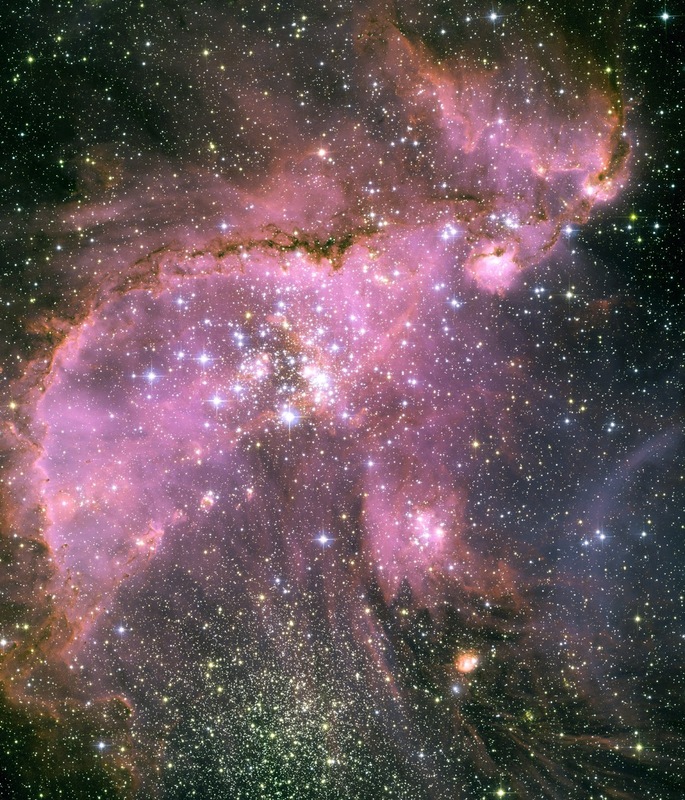 At the centre of the region is a brilliant star cluster called NGC 346. A dramatic structure of arched, ragged filaments with a distinct ridge surrounds the cluster. A torrent of radiation from the hot stars in the cluster NGC 346, at the centre of this Hubble image, eats into denser areas around it, creating a fantasy sculpture of dust and gas. The dark, intricately beaded edge of the ridge, seen in silhouette, is particularly dramatic. It contains several small dust globules that point back towards the central cluster, like windsocks caught in a gale.